The 2017 AMAs happened last night and everyone is still in shock at who took away the most awards. It brought together music’s biggest stars and your favorite celebs in the same room. Sure, we were stoked to see all of the killer musical performances (I see you, Pink! )… but in reality, my eyes were glued to the gorgeous trendsetting beauty looks everyone was serving on the red carpet. From moody statement lips to bold winged liner, I’ve seen it all! Last night brought some SERIOUS hair and makeup inspiration with a star-studded lineup including Heidi Klum, Selena Gomez, and Hailee Steinfeld. My fave looks from the American Music Awards 2017 came just in time for the holiday party season! Ready for some serious inspiration? Selena has been everywhere in the news lately because she is rekindling her long-standing romance with Justin Bieber… This week, she’s going to be all over the entertainment news because of her fresh new platinum textured lob! For the AMAs red carpet, Selena’s makeup artist opted for very little makeup – just mascara and dark brows. Her berry stained lips popped against her new hair and really made her Coach dress look even edgier. This look is so great because of its simplicity and ease to replicate. Demi Moore or Demi Lovato?! She’s doing some serious channeling. Demi’s song “Confident” is no lie. She was just that singing Sorry Not Sorry and threw down with those pipes of hers!! Not only on the stage but Demi was making statements all over the red carpet last night as well… To begin with, her date was none other than Danica Roem, who was elected Virginia’s first openly transgender legislator (which is totally freaking awesome!!). Now, take a look at her gorgeous bronze smokey eye! Her entire makeup look is so timeless. With matte pink lips that are the perfect shade against her tan skin and black hair, she’s owning that carpet tonight. 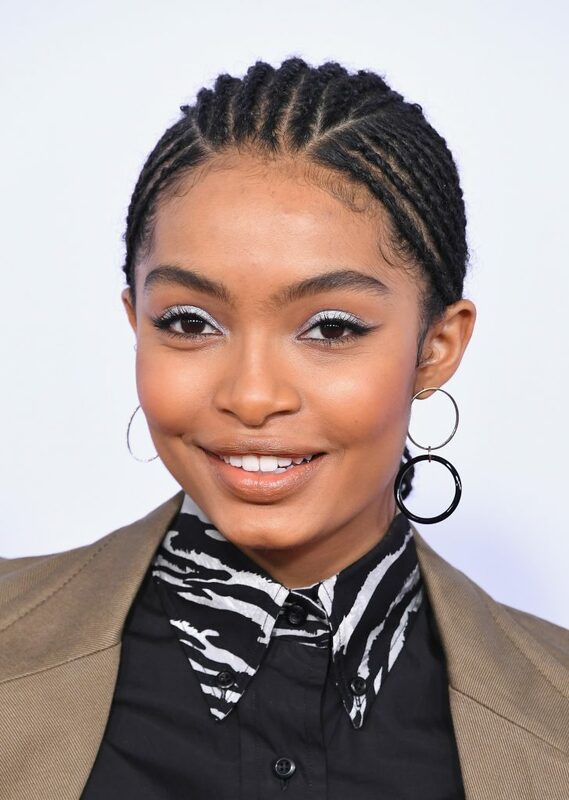 Yara, best known for her role on Black-ish, was the epitome of cool with her frosty white eyeshadow and soft winged liner. Her neutral toned lips made the icy tone of her eye makeup the focal point of her entire look. Love, love, love! Hailee is killing this look. The combination of her slicked back hair, matte skin, sultry brown eye makeup (that seriously simmers), and peachy lipstick is giving me such edgy vibes! And get a look at those amazingly arched brows!! This is also a makeup look that is super simple to recreate and would be perfect for everyday wear. Kat is best known for her role on The Vampire Diaries, but last night she was known for her sophisticated and glamorous makeup look. Omg… her skin, that dress…. perfection! Her earthy smokey eye and classic winged liner with falsies and a glossy lip is a great look to recreate for the holiday season. Heidi is an icon that can slay any runway or red carpet she rocks those model hips on. She’s a Victoria’s Secret Angel, supermodel, supermom, superjudge, supe… hell she’s just super!! She can make every makeup look instantly gorgeous. I love that she opted for similar purple shades that I just posted on my IG a couple days ago on one of my models. Violet is the new fall trend! You heard it here first! A fun twist that makes for a glam futuristic look. Bravo, mama. Bravo! Wowza! Has Miss Ash come a long way!! Ashlee may not be making music these days, but she’s still in the music world supporting her diva of all divas mama-in-law Diana Ross on her special tribute last night. Most anticipated moment of the eve for me. Ashlee’s look was THE ultimate party makeup. Big lashes, a killer smokey eye, flesh colored lips, and shine in all the right places! Again… there’s that purple! And she slayed it like no other. Sabrina is best known for her role on Girl Meets World. I had the pleasure of chatting up her co-star Cecilia (Ceci) Balagot at Hollywood Swag Bag’s 2nd annual gift lounge in honor of Teen Choice Awards Weekend. 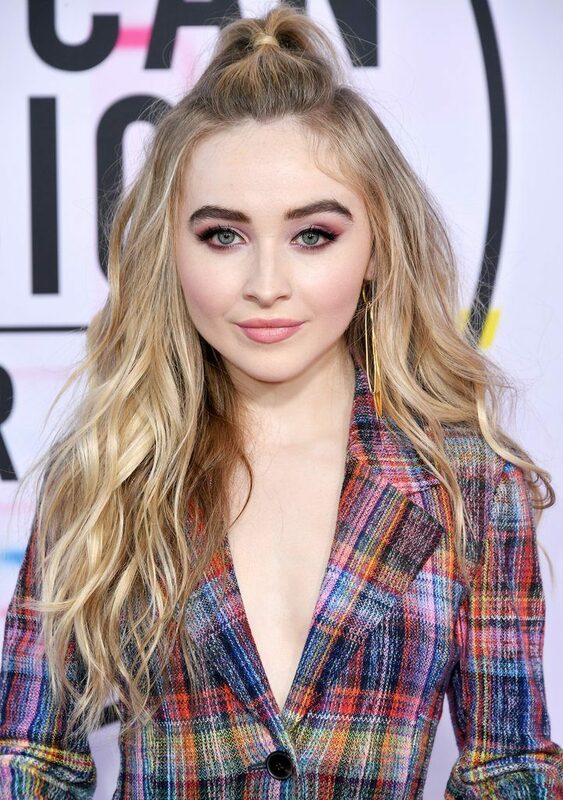 Sabrina’s red carpet makeup look is cute as hell. The colors of her eye makeup match her multi-color blazer and the bold cat eye compliments her perfect brows. I’m obsessed with this it-girl look! Notice the violet + mauve pattern here?! I would definitely recommend trying this look to see how many heads you’ll turn when walking onto campus. #YasQueen! All of these looks were gorgeous in their own right, and I couldn’t possibly pick a favorite! But if My arm was twisted and I had to, Ashlee would take it. Also I noticed trendsetting babe Lily Collins didn’t make a red carpet appearance… I bet her fans are tearing up. What was your favorite look of last night? I want to know! Comment below or hit me up on Instagram @bossomakeupbeverlyhills.